As with the previous three apps, the new DisneyNow app offers content from the channels, and live streaming with cable company account credentials. Without a cable account, there is still free content available designed to draw in new customers, like premiere episodes of series. "The decision to consolidate our Disney Channel Watch' apps into the new DisneyNow app was driven by what kids told us they want in a video experience," Disney Channels' Vice President of Digital Media Kimberly Hicks said to Variety. The new app "enables us to showcase great stories and characters, and bring the magic of Disney Channel, Disney XD and Disney Junior to their daily lives." Disney notes that there are entire catalogs of many of its shows on the apps including Andi Mack," "Raven's Home," "Bizaardvark," "DuckTales," "Elena of Avalor," "The Lion Guard," "MECH-X4," "Mickey and the Roadster Racers," "Milo Murphy's Law," "PJ Masks," "Puppy Dog Pals," "Star Wars Rebels," "Stuck in the Middle," "Tangled: The Series", and "Vampirina." 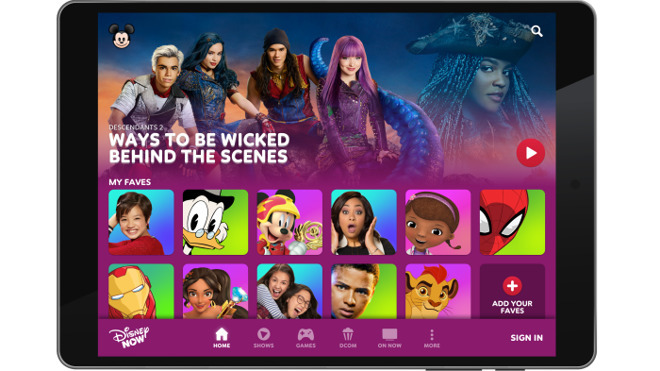 The new app contains more than 60 games tailored to the streamed shows, select musical performances from Radio Disney, and a range of movies available to watch on demand. Above and beyond Disney Channel programming, the company is expected to launch its own media streaming service. After late 2019, Disney's upcoming streaming service will be the only place the public can stream Marvel and "Star Wars" titles, according to Disney CEO Bob Iger.